Fort Polk Historical Marker. Image available on the Internet and included in accordance with Title 17 U.S.C. Section 107. Map of Brazos Santiago Pass. Image available on the Internet and included in accordance with Title 17 U.S.C. Section 107. Zachary Taylor. Image available on the Internet and included in accordance with Title 17 U.S.C. Section 107. U.S. Navy Steamer USS Daniel Webster leaving Port Isabel, Texas, Carrying U.S. Troops, 1861 (colorized). Courtesy of Norman Rozeff. Sketch, Fort Polk during the Civil War (circa 1863), by C. E. H. Bonwill. Courtesy of the Corpus Christi Caller Times. Image available on the Internet and included in accordance with Title 17 U.S.C. Section 107. FORT POLK. 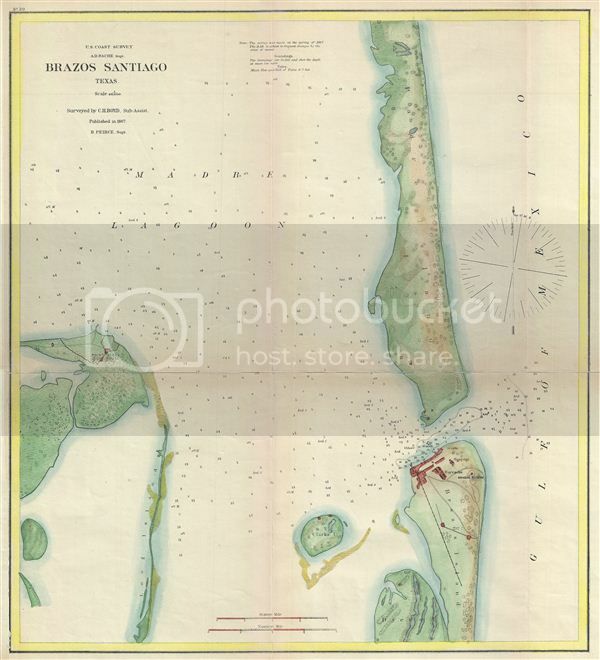 In 1840 the government of the Republic of Texas debated the construction of a fort on the north end of Brazos Island in what is now Cameron County, six miles north of the Rio Grande at Brazos Santiago Pass. 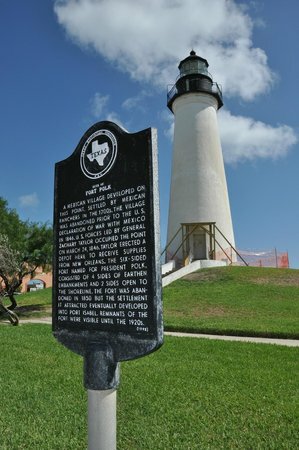 This installation would not only have controlled navigation through the vital pass between Padre and Brazos islands, but would also have established a Texas military presence in the disputed territory below the Nueces River. Since the site lay 120 miles to the south of the nearest white Texan settlement, however, only nominally in Texas territory and on the site of Brazos de Santiago, a customhouse and outpost of the Mexican army, the planned fort never materialized. In March 1846, with the heightening of international tension after the annexation of Texas to the United States, Maj. Gen. Zachary Taylor marched his army of observation from Corpus Christi to the Lower Rio Grande Valley. After his forces crossed the Arroyo Colorado and continued to advance to the Rio Grande. Mexican authorities advised the populace of the El Fronton (later Point Isabel or Port Isabel) to evacuate the town and retreat to Matamoros. Taylor's forces burned El Fronton and proceeded to Brownsville, where they established Fort Texas. Major John Monroe and 450 soldiers erected Fort Polk, named after President James K. Polk, at the highest point in El Fronton. The fort was also known as Fort Brazos Santiago. The fort had rampart on all four sides, but remained open on the two sides facing the Laguna Madre sides. The armament consisted of six brass six pound cannon, two eighteen pound cannon, and two naval guns. Fort Polk was garrisoned from 1848 until 1850 by Capt. F. C. Hunt's company of the Fourth United States Artillery regiment. By January 1849, however, the buildings were being moved to different locations on the Rio Grande, and on February 9, 1850, the post was abandoned. The land was returned to the Garcia family of the Santa Ysabel land-grant, and the landmark lighthouse was constructed in 1852. The location was used as a transit depot for materials for Fort Brown in 1852, and on February 21, 1861, at the outbreak of the Civil War, it was seized by a Confederate artillery company from Galveston. Long afterward, the United States Army Corps of Engineers straightened the channel and installed jetties in the pass, obliterating the site of both the Mexican fort at Brazos Santiago and Fort Polk. K. Jack Bauer, The Mexican War, 1846–1848 (New York: Macmillan, 1974). Dr. J. A. Hockaday to the Valley History Society, January 14, 1954, Vertical File, Harlingen Library Archive Room. Gerald S. Pierce, Texas Under Arms: The Camps, Posts, Forts, and Military Towns of the Republic of Texas (Austin: Encino, 1969). Valley Morning Star, September 22, 1946. Handbook of Texas Online, Thomas W. Cutrer, rev. by Norman Rozeff, "FORT POLK," accessed April 20, 2019, http://www.tshaonline.org/handbook/online/articles/qcf10. Uploaded on June 12, 2010. Modified on October 25, 2016. Published by the Texas State Historical Association.